The Aurora™ Times-2 Speed Files® Starter Unit from Richards-Wilcox consists of an inner cabinet with 8 shelves per each side that rotates within an outer cabinet. 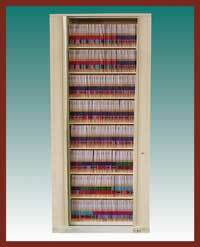 This rotary cabinet comes with slotted and adjustable shelves and two dividers per shelf opening. Store everything from end tab folders to hanging files and computer media with a slight change of configuration. Units have dividers, levelers, an aluminum pedal, a standard cylinder security lock, and 8 adjustable and reversible shelves with a lip on one edge. Insert the shelf "no lip" side forward to access file easily. Insert the shelf lip side forward and the shelf can securely hold disks and boxes. The bottom shelf is fixed and built into the design of the rotor bottom.